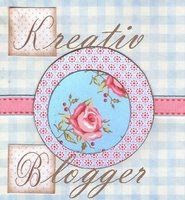 I was honored to receive an email from Amy today that she had nominated me for the Kreativ Blogger Award. I'm not big on passing along the awards - I usually just pass them on to all my readers, as picking just one or two isn't easy.....But today, I'm nominating the following fellow bloggers because they have inspired me to be where I am today - be sure to check them out. I am so happy for YOU! Congrats GF! You so deserve the praise. (and sheepishly...tu for the honor), it is so nice to share and learn with and from you! hugz..